To increase equality and justice for all Canadians by working to diminish the gap between the federal and provincial law of Canada and its application through education, advocacy, and participation in legal interventions. Canada is going through hateful times. Canadians and our American neighbours to the South are living through an extended period of decreased standards of living and reduced expectations. For the first time since the baby boom, the generation of young adults today are expected to be less well-off financially than their parents were. In the United States, the unexpected rise of President Trump into power is a stark warning of the consequences of ignoring the dangers of divisive voices within our society. "I have had the opportunity to meet many marginalized Canadians through my work as a parliamentarian. Whether it is older women who are affected through sexism and ageism or if one is attacked because of their sexual orientation, education and advocacy is key to stop discrimination. The role of the Morgane Oger Foundation is needed in Canadian society." When people see their dreams and their expectations escape their grasp, they are tempted to blame others as the cause of their misfortune rather than pointing at their disinterested politicians or even at themselves. Populist anger over unmet expectations has historical precedents that have ended very badly for marginalized communities, like what happened in Europe during the early 20th century. In recent years racism, faith-based violence, homophobia and transphobia, and discrimination against indigenous peoples have seen a steady and alarming rise in Canada. 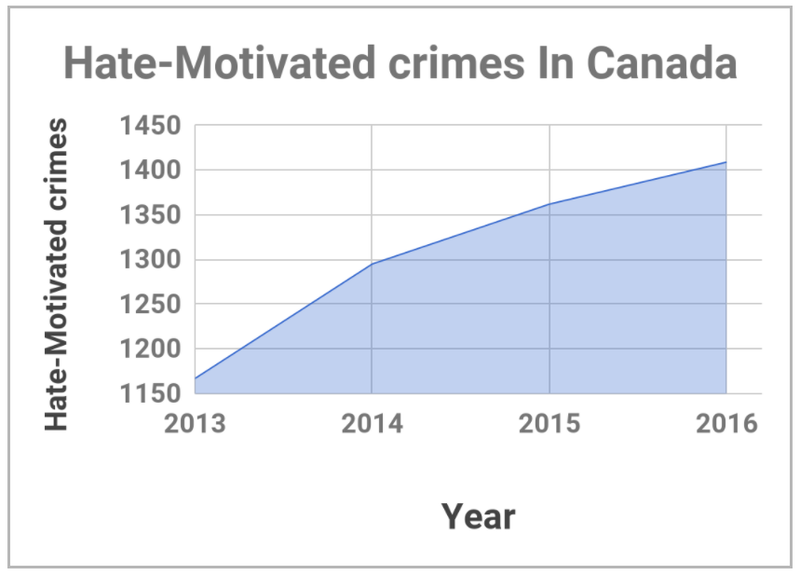 Hate-based violence tracked thanks to provisions of the criminal code of Canada has been rising year after year since 2013. The unaffordability of housing has led to an upsurge of racist sentiment and blaming of visible minorities by some for their inability to buy a home or live in major urban centers. Hate-motivated violence has been rising year after year since 2013. In British Columbia, in 2016, hate based violence increased 25% year-over-year. In 2017, a man entered a mosque and massacred six worshippers, wounding numerous others, because of his hatred of Muslim persons. A First Nations man was made to March naked through a police station after being beaten severely by police. Social conservative extremists throughout the country are distributing hateful material in people's homes and at public events in an attempt to prevent the equal protection for all Canadians against discrimination on the basis of gender identity or expression. An elected official responsible for schools in British Columbia has called the support of transgender students transition child abuse and is advocating for conversion therapy to "pray away the gay" for transgender and other LGBTQ2+ youth when it is in fact his legal responsibility to protect them against such actions. In Quebec, the hate group “La Meute” is intimidating anti-racism Advocates and organizing against anti-racism efforts. In British Columbia, the KKK and white supremacist groups Sons of Odin are organizing on homophobic, transphobic, and racist ideas. The Morgane Oger Foundation is needed to help push back against this rising tide of hate. We will organize campaigns to educate and advocate against erasure and bias in an effort to help Canadians see that inclusion and love are the antidote to hatred and bigotry. Whereas it is the foundation's strong belief that education and advocacy are the best tools for changing hearts and minds of Canadians, we recognize that sometimes a legal precedent needs to be set and will reluctantly participate to see to it that this happens. Where advocacy and education fail to change their actions in adherence to the spirit and the letter of the law protecting human rights of Canadians, the Morgane Oger foundation will financially support litigation aimed at definitively addressing discrimination against marginalized communities through precedent-setting judgements. The Morgane Oger Foundation’s first project will be to support litigation hoping to definitively confirm the newly-added protection from discrimination on the basis of gender identity or expression. Through this action, once and for all, transgender men and women and other persons affected by discrimination on the basis of transphobia will be free from the erasure and the bias that those opposed to the idea of transgender persons existing continue to insist on putting in the way of this communities equal enjoyment and fulfillment of their lives.